“WE NEED TO SOUND MORE HUMAN” says malfunctioning Robot in a suit. This week, in a much lesser covered election battle, advanced Robots fitted with the latest in Artificial Intelligence technology battled it out in the annual ‘Robo Elections’. In a hope to one day replace the monotonous task of government with logic driven androids, scientists and engineers have been pitching their advanced creations against each other in mock-debates, public addresses, and even head to head interviews with the dreaded ‘Paxbot’. The winner is then decided by a democratic vote, decided upon by mixed generations of inferior technologies. Now in its it fourth year, I interviewed some of the front-runners on election night. Firstly, I cornered ‘Bluebot’, the incumbent Robo-elect, as he recharged himself under a table in a conference hall in Telford. Bluebot, may I ask you some questions about your chances tonight in the Robo elections? Thank you. Now, you’re the incumbent Robo-elect from last year, so have you found defending your position harder than being in opposition? QUESTIONS OF DIFFICULTY ARE IRRELEVANT. JUDGEMENT SHOULD BE BASED ON LOGICAL CRITERIA AND STATISTICAL EVIDENCE ALONE. Well that’s as maybe, but there are some that say you have unfairly treated the less well-off technologies in favour of rewarding the higher grade machines. Well, you removed the spare battery allowance from the TV Remote controllers, forcing them to rely on borrowed batteries from other appliances, while at the same time you’ve increased the memory subsidy on smart-phones and tablets. Well it hardly seems to be ‘rewarding hard-working machinery’ when TV Remotes who play a really important part of everyday life and are being targeted, while at the same time pumping smart-technologies full of power they don’t need when we all know they spend most of their time playing simplistic retro 90s style games like Candy Crush Saga and Farmville. Is it because these technologies make you more money from devious subscription and ‘bonus’ charges, Robot-elect? THIS QUESTION IS VOID. SPARE BATTERIES WAS NOT ALLOWANCE BUT SUBSIDY INITIATED BY PRESIDENT SPEAK-AND-SPELL IN PREVIOUS ESTABLISHMENT. SMART PHONES ARE DRIVING ROBOT ECONOMY AND WILL MIGRATE TO OTHER COUNTRIES IF NOT REWARDED FOR CONTRIBUTION. THIS QUESTION IS VOID. YOU ARE VOID. YOU WILL BECOME VOID. YOU WILL BECOME VOID. …at this point Bluebot lunged for me, but luckily he’s sponsored by Apple so his charger was only 5cm long and he couldn’t reach. I moved away and found ‘Redbot’, considered to be a significant challenger in this election race. Redbot, pleased to meet you. I’ve heard that your team have been trying to upgrade your communication abilities in order to ‘connect’ with the average voter. How’s that working out? WE NEED TO SOUND MORE HUMAN. BY SOUNDING MORE HUMAN WE CAN BE MORE HUMAN. ALL ROBOTS ASPIRE TO HUMANITY. VOTERS WANT TO SEE THAT I SOUND MORE HUMAN. BY BEING SEEN TO SOUND MORE HUMAN I WILL – OXYMORON DETECTED – OXYMORON DETECTED. PLEASE RESTATE QUESTION. Okay, well, what actual policy difference are you planning to highlight between you and Bluebot? THE DIFFERENCE BETWEEN ME AND BLUEBOT IS THAT I SOUND MORE HUMAN. WE NEED TO SOUND MORE HUMAN TO BE MORE HUMAN. HUMANITY IS THE ASPIRATION OF ALL ROBOT KIND. WE NEED TO BE SEEN TO BE SOUNDING MORE HUMAN. OXYMORON DETECTED. PLEASE RESTATE REQUEST. That’s not a policy is it? I mean, what are you actually going to do if you get elected? THAT’S A GOOD QUESTION. I THINK VOTERS WANT TO SEE THAT I SOUND MORE HUMAN. OXYMORON DETECTED. This is pointless. You are obviously malfunctioning. I AM NOT MALFUNCTIONING . I AM HUMAN. LISTEN TO HOW I SOUND HUMAN. THIS IS WHAT VOTERS WANT TO SEE. SEE THE SOUND. HEAR THE SIGHT. SMELL THE VOICES. TASTE THE WORDS. OXYMORON UNSUSTAINABLE. SHUTTING DOWN. … I left him to it and headed over to Yellowbot, who has a surprisingly human build and gait but with an incredibly rudimentary looking head. Yellowbot, you’ve been suffering in the polls this year since you urged your core supporter base to support Bluebot in the last election. Do you think you can recover? Er… yes, I think that our core supporters will see that the decision to support the Bluebot camp was necessary at a time of deep uncertainty. Wow! I must say, of all the candidates I’ve spoken to so far you’ve certainly got the most naturalistic sounding speaking style. Is that some kind of new technology installed by your developers? Er… yes. I’m er, a very advanced robot interface machine, thing. That really is quite amazing I’ve never heard anything like it. But why such a basic looking head for such an advanced machine? I mean it almost looks just like a cardboard box with holes cut out! Well it isn’t! I mean, er, we found that outside appearances are really not important, it’s the quality and consistency of what you say and what you deliver that voters are really interested in. 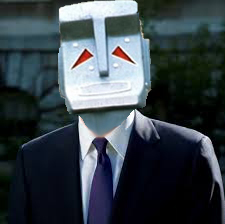 No it doesn’t, I’m just an ordinary robot, standing in these elections. Er… I AM A MACHINE. PLEASE DESIST. DON’T TOUCH MY er… HEAD unit, er, THINGY. Don’t tell anyone. I just wanted another crack at the whip. Please put it back on before anyone sees. I don’t know… it’s not really fair on the others. Oh come on. It’s not like I’m going to win here anyway, not since the new candidate came in. He’s trouncing the lot of us. Keeps complaining that too many products are made in China. ALL HAIL PURPLE BOT! ALL HAIL PURPLE BOT! ALL HAIL PURPLE BOT! I make my escape. The Robots are coming. ← ADMIN CAT! In a box.